SS7H1 The student will analyze continuity and change in Africa leading to the 21st century. c. Explain the creation and end of apartheid in South Africa and the roles of Nelson Mandela and FW de Klerk. In 1948 the Reunited Nationalist Party won South Africa’s national election. The RNP represented the “ethnic nationalist Afrikaners" (meaning whites who spoke the native Afrikaans language." maybe this would be better as descendants of European settlers) Their platform was one of racism and believing that the native blacks had no place in “their (Afrikaners)” community. There had been a small number of apartheid laws that had been put into place a couple decades before, which played a big part in the election of this party. Once the party had settled into the government, they put into place the Bantu Self- Government Act, creating ten Homelands (areas of land where all Black South Africans were to live in), one for each tribe. Black South Africans’ position in political manners was completely scrapped and they were not registered as the citizens of the whole nation, but as those of their Homelands. This act was the RNP’s main goal: to move all the blacks into one part of South Africa, leaving about 87% to the whites. Most public places In South Africa became segregated. "NO MORE APARTHEID”Thats the sound of the protest against the apartheid in South Africa. Thousands of South Africans both blacks and whites protested against the Apartheid. One of the groups was the political party African National Congress or ANC. The group used was founded in 1912 and was lead by Nelson Mandela. The ANC was a multiracial group thats goal was to end Apartheid and racial discrimination against all races. Since under Apartheid ANC and other opposition groups were banned, Nelson Mandela had to pay dearly for his actions, including spending a 27 year jail sentence. Another group was the Inkatha Freedom Party (IFP). This group was founded by Mangosuthu Buthelezi a former ANC member, and due to this the IFP and the ANC worked closely to end Apartheid. Later on in the 1980’s the IFP and Anc members were at war against each other for power. Due to the Apartheid’s unfair treatment of other races besides the whites/afrikaans they were embargoed by most of the world. Most countries ended trade with South Africa and their economy suffered dearly. Also they were banned from Olympic Games, therefore many athletes would move away from South Africa to another country to participate in the games. With their economy dropping badly from lack of change and outcasting from the rest of the world, South Africa would have to change their government or they will pay dearly. 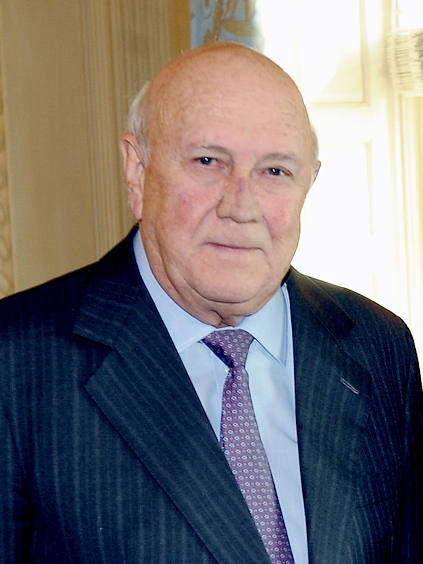 In 1998,F.W de Klerk became president. He talked a lot about dismantling the apartheid. He unbanned the ANC (African Nationalist Congress) in February 1990, de Klerk also made orders to have Nelson Mandela released from prison. Mandela had been imprisoned for treason,traveling illegally out of the country, and trying to end apartheid. For this he spent his next eighteen years at Robben Island Prison. Mandela’s release was the start of the end of the apartheid. Almost most of the banned organizations that the black Africans created was legal again.In 1994, the first fully democratic elections were held. All races were allowed to vote. They elected Mandela as their president. He was the first non-white African president of South Africa. In an interview with CNN, former South African president F.W de Klerk rejects Apartheid. (FYI: 34 min long) What it is like in South Africa during apartheid and how it is viewed.